If you are looking for information on the Dagwood's Sandwich Shoppes franchise business opportunity, Dagwood's Sandwich Shop franchises or Dagwood's Sandwich Shops franchising, then you have come to the right place. of a dynamic new franchise business that is taking the fastest growing category in the industry by storm! Dagwood's Sandwich Shoppes™ is one appetizing business opportunity that really stacks up! Dagwood's is a franchise development and expansion company structured to become one of the fastest growing chains in history, built on the power of a brand that is famous throughout the world, and is synonymous with "all things sandwich." Dagwood has truly been the "#1 Name In Sandwiches" for over 70 years ... not only have his sandwiches been featured 2-3 times a week in the Blondie comic strip since 1936 ... the word "Dagwood" is even listed in Webster's dictionary! Over 280 million daily readers, in 2500 newspapers worldwide - more than 3 times the annual US audience for the Super Bowl! 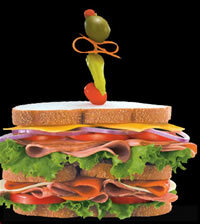 Nobody knows sandwiches like Dagwood, and nobody appreciates a great sandwich more than our target customers. Our target market - the heavy sandwich users, who also happen to be Baby Boomers - have sophisticated and adventurous tastes. They demand complex flavors, ample portions, quality ingredients and authenticity in recipes. And Dagwood's menu - designed by Dean Young, Dagwood's co-founder and creator of the Blondie comic strip, and Executive Chef Geoffrey Rhode - is sure to satisfy the Baby Boomer palate. The Dagwood's menu includes signature sandwiches like New York deli-style Hot Pastrami and Corned Beef sandwiches, a traditional pressed Cuban sandwich, the New Orleans Roast Beef Po'Boy, Chicken Curry Swirl, and the quintessential Dagwood - a mouthwatering pound and a half skyscraper sandwich that would satisfy Dagwood himself! Development Territories & Franchises Are Available And They're Going Fast! Dagwood's has created a nationwide network of 89 Market Partner™ development territories that offers savvy entrepreneurs a one-of-a-kind, ground level opportunity to build a mini-franchisor company of their own. Each territory is owned, developed and led by a Dagwood's Market Partner. This ensures individual franchisees will receive ongoing support and training. Each Market Partner operates a training store. Market Partners have primary responsibility for the growth of stores throughout their territories and for growth in individual store sales. They derive revenue from a significant percentage of each franchise's contract fee and ongoing store royalties, as well as from the operation of their training store. For Market Partners, that means that if you act now, prime territories are still available. For individual Shoppe franchisees, that means that if you move quickly, you can have a better choice of prime real estate and Shoppe locations. An Intranet Support System, including a daily, downloadable video newscast - Dag's World - that delivers up-to-the-minute reports, information and special features from Dagwood's HQ. ACT NOW! To find out more about Dagwood's, Just fill in the form below, and we'll be in touch quickly with more information.